If you’re lucky enough to live right beside the ocean, I’m envious of not only your view of the surf, but the incredible fertilizer you have at your doorstep. Sea minerals fertilizer is definitely my favorite organic fertilizer. It has very noticeably improved the health and increased the growth and yield of many of my plants. Rivers and volcanoes have been adding minerals to the sea for hundreds of millions of years, which is why it is so nutrient dense in there. That’s what we need to emulate in our gardens. Yes, the ocean has salt, but it also has over over 80 other minerals that are immediately available to plants upon application. On the other hand, seaweed fertilizer and fish fertilizer and most organic fertilizers need to be worked on by microorganisms first – not a problem if you’re ensuring these microorganisms are there, but just an extra step in the process. Dr. Maynard Murray was one of the early pioneers of using sea minerals for fertilizer. He purchased a farm and started bringing railroad cars of ocean water in to fertilize it. 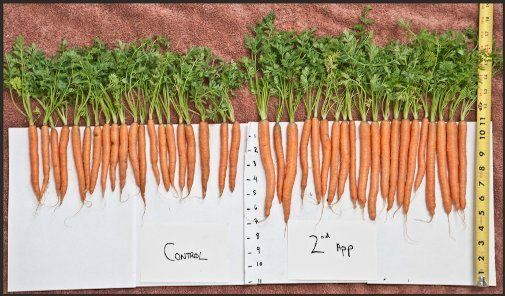 He got bigger yields, tastier and more nutritious food, far fewer pests and just healthier plants in general. If you’re lucky enough to live near the ocean, you don’t need to go through the process of concentrating the sea water down and removing the sodium chloride. Certainly there are benefits to that, but there’s also something to be said for walking out your door and getting some free fertilizer. Of course you don’t want to use ocean water from a polluted bay, but if your little piece of sea is relatively clean, go for it. As for application rate, early experiments showed that various plants would take anywhere from 1200-3000ml of sea water per square foot of soil. That’s a lot! Apparently 1 application would last for 5 years. If I’m doing it, based on what I’ve learned, I apply more like 1 teaspoon diluted in 3 Tablespoons of water (1:10 ratio) per square foot (5000ml of ocean water per 1000 square feet), 4 times per year every year, for both foliar and soil applications. But most of us don’t live by the ocean. Fortunately, there are a couple of companies doing a really good job of concentrating that sea water down into a liquid fertilizer while still retaining the important constituents of the water. The product I use is called Sea-Crop and I’ve been using it for many years. Thirty gallons of seawater are used to make 1 gallon of this concentrate. The first is that 95% of the sodium chloride is removed. Now in my view, this isn’t as big of a deal as the manufacturer contends, as I believe the sodium and chlorine are just part of the natural balance of sea minerals, but what I do like is that have less sodium allows for a higher application rate than could otherwise be used. But the bigger reason I like this product is because they do a great job of retaining the microscopic organic component of the water – the dead (and perhaps some living) microbes and plant matter. 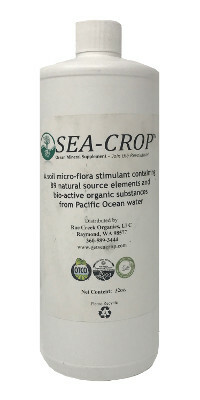 I’ve done a lot of research into the various methods of processing ocean water and usually this component is substantially decreased, especially in sea solids fertilizer such as ‘Sea Minerals FA’ and ‘Sea 90 Fertilizer’, therefore so is the effect on plants (these are still fine products and certainly useful in some cases, but I prefer the much more alive Sea-Crop). It’s more expensive than liquid kelp and fish, but the application rate is only 1/3 quart per 1000 square feet annually (up to 2/3 quart for orchards), so it doesn’t end up costing much more. I use 1/3 cup of sea minerals fertilizer per 1000 square feet (or 2/3 cup for orchards), every other month, alternating with liquid fish fertilizer (eg. fish in March, sea minerals in April, fish in May, etc.). So for me 1 quart will do 1000 square feet for 3 years, and 1 gallon will do 4000 square feet for 3 years. Mix it with at least 50 times as much water, which is 1/3 cup (5 Tbsp) per gallon of water. Sea minerals is great mixed with liquid seaweed and molasses/dextrose. It also goes well with EM, compost tea and mycorrhizal fungi. The manufacturer of this sea minerals says it’s best not to apply it in the same spray as liquid fish in order to keep its effectiveness optimal – I’m not sure how big of an issue that is, but it’s one reason I started alternating them every other month. To soak your seeds for 4-12 hours before planting, you can mix it with 100 times as much water, which is 1/2 teaspoon per cup of water. I also often mix with liquid seaweed when I do this. When you buy this sea minerals fertilizer, you get enrolled into my online Biostimulants course. Is my favorite fertilizer, often producing very impressive increases in growth and yield, not to mention plant health. Is made by concentrating clean ocean water 30 times, removing most of the sodium chloride, keeping the other remaining 80+ elements along with the beneficial organic component. Is organic, OMRI-Listed and the most sustainable fertilizer I know of. I DO live by the ocean, 8 blocks away actually, and I live right off a canal connected to the ocean, so I have great access to both ocean water and seaweed. So, if I were to use the sea water, you said 1 teaspoon per square foot, so does the sea water get diluted? I also asked this before, but doesn’t the salt harm the plants? Yes, I would dilute it with 10 parts water. You’d think the salt would harm the plants, but it generally doesn’t. There may be certain plants that are especially susceptible to salt damage, but they probably wouldn’t be doing very well 8 blocks from the ocean anyway. 2 years later. What has been the result of your experiment? i honestly don’t remember where i used it, if it was on the beds in the courtyard, it worked great, on my veggie plot, so so. i’ve used more seaweed actually. i think my veggie plot needed to get more organic matter and build fertility, and seems to be getting better, whereas the soil in my courtyard was already pretty good. i have a 2 gallon ez flo system. how much do you add and how do you know when you have gone through it since it is constantly hooked up to a water source. and no other fertilizer then for 3 months? sounds good but i am so used to fertilizing at least once a week. thanks. Sorry Debra, I’m not sure how the ez flo system works. Do they give you a way of determining the dilution rate? My Gilmore hose-end sprayer is set on 1 tbs per gallon when I spray a molasses/liquid seaweed/BioAg mixture for my 1000 square foot growing area. Could I add some sea minerals to this mixture and, if so, how much? Thanks. Sure, I use 1/3 cup per 1000 square feet every month or two. That dilution rate is plenty, so you’re good to go. Thanks! I’ll order some of your sea minerals today. Also, FYI, the video at the end of this academy lesson doesn’t work (“YouTube Remineralization”). The message I get when I select it is: “This video does not exist.” Thank you again for your academy and your willingness to answer questions. Our neighbors are beginning to ask questions like, “Okay. What are you doing differently?” So people are noticing an improvement around here. Yes, it contains trace amounts of iron and every other mineral, but not too much of anything. For iron, it’s 15 parts per million. Hi Phil, I am VIJAY from Malaysia. I do practice using beneficial microbs in my garden. By using sea water 1:10 does it harms the mychorriza networke, trichoderma, paecilomyces lilacinus and I do all so use becillus subtilis, pseudomonas fluorescens and many other microbs . As long as you don’t use too much, it will be fine. I even combine sea minerals with my inoculants sometimes. Fertilizing is a bit more complicated than that, but what I can say is that sea crop is the only fertilizer you need for supplying micronutrients. For macronutrients, you may need some specific minerals such as calcium and phosphorus, which can only be discovered by sending a soil test to a good soil lab to see what you have. Hi Nelson, the few sea mineral products I know of (including this one) are some form of concentrated sea water with nothing else added at all. This one here is even registered organic, so no synthetic nitrates for sure.I have seen an analysis of Sea Crop somewhere before, but no, I don’t have it right now. I’ll let you know if I ever find it. Sorry Nelson, I’ve never heard of that product and can’t find any information on it online. Hi, I’m on ocean in Fla. Do I just dive down and get a bucket full of seawater? Heard it wasn’t concentrated enough. What do you think? I’m very new to all of this, but very interested. Please advise Thanks. Yes, I use 5 quarts per 1000 square feet, mixed in 10-15 gallons of water and watered onto plants and soil. It’s not nearly as concentrated as the sea mineral fertilizer products available, but it’s still full of minerals (which you can taste when you go swimming). Phil: How often should I treat w/sea salt? Once a month? year? Also, should I skim the top of the ocean water, or jump from boat, in and go a few feet under to harvest? Thanks for responding. I do it 4 times per year. Skimming off the top of the ocean is perfectly fine. After you dilute the sea water how do you apply it? I assume I would be applying to my plants? Yes, you can dilute it in a standalone sprayer (like a backpack sprayer) or use a hose-end sprayer (which then does the diluting for you) to spray it onto your plant leaves – and the soil as well. I have been given some dead sea mud, is it beneficial as a fertilizer? Hmm, I’m not sure Ben. Do you have an analysis of what it’s comprised of? And any kind of mineral analysis? The research has been all over the map about how much to apply, but I’ve settled on applying less ocean water, sprayed more often, in order to avoid applying too much at once.I do 5 liters per 1000 square feet 4 times per year, which would be 1250ml per 250 square feet, or exactly 1/3 gallon of ocean water. So ya, you’d have to make a few passes with the little Gilmour. As for the dilution rate, setting 10 is the highest setting the Gilmour does, which is perhaps unnecessarily dilute, but that’s fine.Alternatively, to speed things up, you can use a watering can, and a 1:10 ratio is fine, which is 375ml (1.5 cups) per gallon of water. So that’s 3.3 gallons of water for your 1/3 gallon of ocean water. Hope that helps. I generally think in terms of square footage: 1/3 cup per 1000 square feet, 4 times a year. Twice as much for fruit trees.RASPBERRIES:If the raspberry patch is 3 feet by 50 feet, that’s 150 square feet. 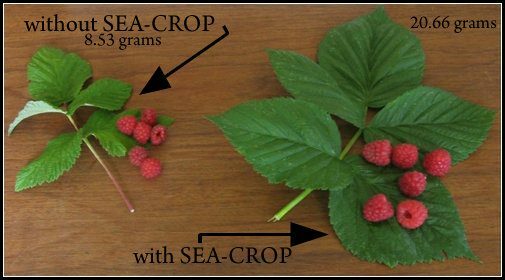 At 1/3 cup per 1000 square feet, that’s a little less than 1 Tbsp for the raspberries – 4 times a year.TREES:Here’s what the sea minerals product developer says for trees:Medium size trees (size 3-6 feet): use 4 oz. SEA-CROP® seawater concentrate per tree, not to exceed 10 gallons per acre per year.Large trees (size 6-12 feet): use 6 oz of SEA-CROP® concentrate per tree, not to exceed 10 gallons per acre per year….Depending on tree size, I would use 1-1.5 oz (2-3 Tbsp) per tree – 4 times a year. Sorry there is no scientific proof that see water benefits terrestrial flora and plants cannot use or process the sodium. Good organic soils such as using plain dark compost will better promote good microbes to break down nitrogen and other important micro nutrients. There’s actually a lot of scientific proof, Ken. Not sure if you have access to the research, but you’ll find it there, and even Google will turn up a few things. And yes, plants not only can process the sodium, but they need it – it’s an important nutrient for them. Yellowing of fruit trees is basically a nutrient & lack of nitrogen problem or could be poor drainage -hence the leaching of nutrients. Also there is no mention of sun exposure and the amount of hours the trees receive. Sorry no amount of sea water is going to resolve that issue. 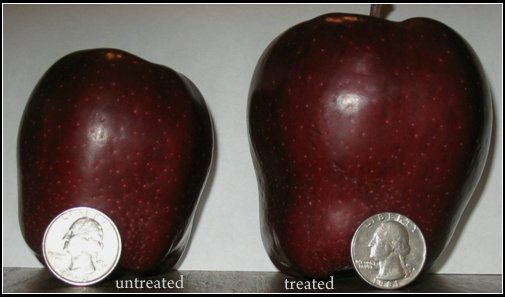 Yellowing of fruit trees can be caused by a great number of things, not just nitrogen deficiency and poor drainage. I farm and am not organic but am interested in using sea salt. Raise corn and soybeans. Have 500 acres but would not be interested in doing the whole farm yet. Right now am interested in knowing a. the availability of your product for this size acreage b. the application rate/year c. the preferred application method ie. broadcast on the soil surface and or applying it in the seed trench d. rough estimate of the cost/year d. do you have any producers that have used you product on a large scale? a. Yes, if you email me your shipping address and the acreage you want to buy for, I will quote you. b. The annual application rate is 2-4 gallons per acre, generally divided into 3 applications, usually in the spring, each one about 3 weeks apart. c. It’s broadcast as a soil drench and foliar fertilizer at a 1-2% dilution rate with water. Often 1 of the applications is before emergence and the other 2 are after, although they can all be done after. d. For 500 acres, I’d say about $30/acre. e. Absolutely. If you email me, I can share some examples. Thank you for your reply to my April ’17 questions, I didn’t see your response till now Jan. 1 2018! I have some SEA 90 dry sea salt ( I thinks that is the name of the product I bought years ago) I am trying to find out what rate of the dry salt (dissolved and diluted) I should use on a per acre basis. Can you help mw with this. You indicated that you could supply me with some examples of large scale farmers that have been using sea 90 as a drench and/or foliar. Would appreciate it you would do that. Corn ~ 2,000 acres, 2 gallons Sea-Crop per acre in the furrow. Result: Made plants stronger and increased yield by 10%. Popcorn ~ 200 acres, 2 gallons Sea-Crop per acre in the furrow with a microbial inoculant. Result: The neighbor across the road on the same type of soil planted the same variety of popcorn. The neighbor used 200 pounds of nitrogen to the acre and the Sea-Crop farmer used 40 pounds of nitrogen. The Sea-Crop treated popcorn gave a 40% greater yield using 80% less fertilizer. The Sea-Crop treated field was ready for harvest 20 days earlier than the conventionally treated field. If the row is 1-foot wide, I would use 1/2 teaspoon (5 ml) of Sea-Crop (or if you’re using ocean water, use 1/3 gallon) diluted in as much water as you need to do the drench. Do this 4 times/year, whether as drenches or foliar or a combination. I know it’s used in hydroponics at a 1:100 ratio (2.5 Tbsp per gallon of water). Did Mr. Murray figure out if the naturally occurring halophilic bacteria and archea in the ocean solids contributed to the positive results on crops? Bacteria from the ocean can be found growing on cheese rinds that have been cured using sea salt and in other foods that have been brined or preserved with sea salt. Good question. I could be wrong, but my understanding is that Murray discounted the biology. What I do know is that the people who make the product discussed on this page believe the biology is of paramount importance and have taken great lengths to preserve it. That’s one reason why the product is liquid instead of solid (because a lot of the biology dies in the dried sea mineral products) and also why the container is opaque, to protect the biology from ultraviolet light.